While last year and so far this year, Oklahoma has not experienced many tornadoes, the rest of the nation has. And one report in the Philadelphia Inquirer suggests the nation has experienced a “stunning increase” in federal disaster declarations for tornadoes in the 21st Century. 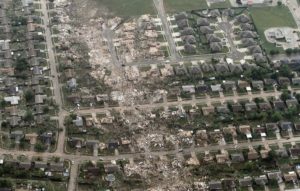 From 1953 to 1982, the Federal Emergency Management Agency issued an average of 27 tornado-related disaster declarations a year. But so far in this millennium, the average is up to 118. The reason is not such much any climate change but more the result of human activity. A recent study found what Oklahomans already know…the most-vulnerable areas for tornado damage is in the Midwest and the South.